This beloved Madrid-born mezzo cannily carved out a name for herself in repertoire that rarely jeopardized the health of her beautiful voice. Born in 1935, her operatic debut took place in 1957 in the role of Dorabella; Mozart was a staple of her career from beginning to end. Other specialties have included Rossini, arie antiche, and Spanish songs. All of these are represented on this generous pair of CDs. Like fellow Spaniard (and Rossini specialist) Conchita Supervia, Berganza's voice often is animated by a rapidly throbbing vibrato. However, like Victoria de los Angeles (also a Spaniard), Berganza sings with a purity one almost might call aristocratic. This mixing of hot and cold elements is what has made Berganza appreciated by many, and not the object of either fanatical worship or dislike – something not many of her famous colleagues have escaped! On top of that, she never earned the reputation of being "difficult" or a diva. One can't fault Berganza in terms of her voice per se – it's a gorgeous instrument. Nor can one complain that she lacks charm. Perhaps that's the problem; her singing is almost always sunny – violent emotions don't ruffle her composure for long. Compare her "Divinités du Styx" (Alceste) to Maria Callas's and you'll immediately notice the difference. Berganza is merely plaintive, while Callas is proud, fiery, and supremely regal. "Che faro senza Euridice" (Orfeo ed Euridice) is similarly under-interpreted; here's an Orpheus whose wife might simply be out for an afternoon of bridge and tea. Predictably, she is better in the songs, where she can get away with being more generalized, and best of all in the songs of her own country. Everything clicks when she is singing in her native language. Decca has drawn from recitals and complete recordings of operas to assemble this compilation. The two excerpts from Carmen are taken from the complete Deutsche Grammophon set; the balance originates with Decca. Although many of these selections have been on CD previously, some have not: the Siete canciones populares españolas by de Falla, the two excerpts from zarzuelas, and the Ocho canciones vascas arranged by Jesús Arámbarri. As has been done on other two-disc compilations of this type, the sequence of the selections is a bit of a head-scratcher. The first disc starts with Rossini, and slips into Mozart, Gluck, and Handel, but returns to Rossini after a detour for Carmen. The selections obviously have been ordered for musical effect, and not for historical sense or logic. 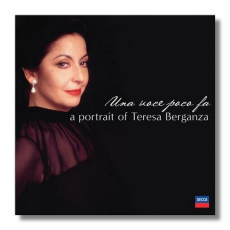 These recordings were made between 1959 and 1977, and are remarkably consistent, not just in terms of Berganza's vocal condition, but also in terms of recording quality.